The wait is over! 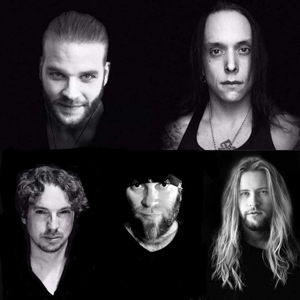 Bill Hudson‘s Swedish/American power metal band, NORTHTALE have unveiled the very first song "Shape Your Reality" from the upcoming album! Stream the "Shape Your Reality" official audio below. "We guess some of you figured out the Easter egg floating around the internet yesterday... :P To those who didn't, here's our first song, a good taste of what we're working so hard on for the upcoming album! More great news to come... For now, enjoy it and #ShapeYourReality!" Los Angeles-based guitarist/songwriter Bill Hudson (NORTHTALE, I AM MORBID, ex-DIRKSCHNEIDER, TRANS-SIBERIAN ORCHESTRA, CIRCLE II CIRCLE, JON OLIVA'S PAIN and more) has become a very sought after name in the hard rock world in recent years. Whether he is in Germany headlining the biggest heavy metal festival in the world or in the studio recording guitars for a video game soundtrack, there’s never a dull moment in the life of the Brazilian musician. In the summer of 2015, he made history in Germany, headlining Wacken Open Air, performing in front of 80,000 fans with the TRANS-SIBERIAN ORCHESTRA. Hudson joined the TRANS-SIBERIAN ORCHESTRA also for their winter tour in 2015, performing 52 shows in 6 weeks throughout the US and Canada for an average of 15,000 fans a day. From April 2017 to April 2018 Bill Hudson made part of the DIRKSCHNEIDER line-up, touring widely both America and Europe. In February 2018 Bill launched his new power metal band, NORTHTALE.